The book arrived on saturday and was waiting for me when I arrived back today. Thanks for sharing and sending it! It's been some time that I read the books. Amazing, how easy it is to slip back into the magical world ... It's nice to hear again from Hogwarts and all those charakters you've spent so much time with. I could have done with more of those wonderful "wizarding details" - but then, it's a play, so its up to the people who bring it onto the stage, isn't it? The book is now well on its way to Lindasaurus. Thanks, Lamilla for sharing the book! Finally... Harry Potter arrived! I was really looking foward to this, as I have seen the book now in so many bookstores and always resisted to buy it, because I knew this ring was coming my way sooner or later. Read the book over the weekend and just loved it! It was so nice to dive into this world, that I used to like so much. Also with me it has been quite some time since I read the books, but I could imagine everything so clearly from page one. I loved how the characters have developed and the jobs they have now. It's almost a pity that it's not a novel, because like bluezwuzel I would have loved a few more "wizarding details". I was just wondering how you could produce this as a play on a stage - doesn't all the magic get lost or what kind of special effects did they use? Anyway thanks a lot for letting me participate in this ring! The book travels on to the next reader! I really enjoyed the play. I was surprised how fast I got drawn into the world of wizards and witches again. It had been a while since I read the novels. Thank you very much for organizing the ring, Lamilla! On it's way to karneol. Enjoy! Arrived today 😁 thank you so much for sharing and also for sending. But it was satisfyingly long for a drama script! I usualy read through a drama in max. 2-3 hours, even less. But then i realised this one is conceptualised to play on a whole day or two evenings. Great!!! Brilliant arrived just as I am between books will read asap. 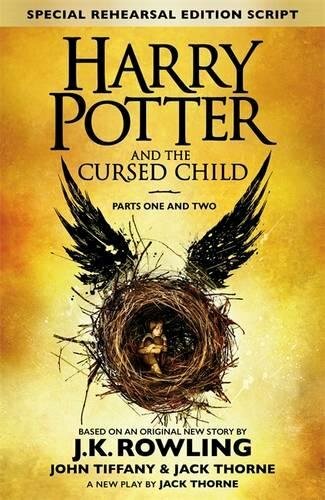 I loved being sucked back into the Potterverse, I could have read it all in one sitting but eeked it out for two days. I thought reading a book that was a script would be annoying but it wasn't because it came with the scene settings. All in all a must read for Harry Potter fans. Received the book in the post yesterday and can't wait to start reading it. Thanks for sending it to me mysteriousmummy and for starting the ring Lamilla. Oh Wow! What a joy to be back at Hogwarts! I read all the books a long time ago but started reading this the day after I had watched the final film on TV so had it all fresh in my mind. Rowling is so clever! I loved the parallels between the two generations and drawing on key parts from the previous books. As others have said a bit more description would have been lovely but I guess I'll have to see it on stage to get the full effect. I'll be sending this on to Silver-Greece in a couple of days. I'm posting this out to Silver-Greece today.